Posted on May 29, 2010 by Elizabeth E.
I made this quilt a couple of years ago, cutting and piecing all in a rush to get it done, working with my collection of fabrics from France. That was my self-imposed structure: only fabrics that I had from France, and that limitation shows in this quilt. I liked the design, but I had to use oranges instead of yellows, greens instead of navy, brown and purples instead of deep blues in the border. I had finished it, but it wasn’t working. The contrasts were off somehow, betrayed by the color, for sometimes when person looks at a fabric they think they are seeing something different–for a brown does look different from a green–but the lack of strong contrast can betray a quilt; contrast is needed to strengthen this particular design. Although it was finished, it was weak at the core. Last year at our local quilt show was a new vendor–one who had bolts and bolts of real French indienne fabrics–those little prints that resemble polka dots or men’s ties. I bought two more lengths of yellow, and 8-10 pieces of navy blue, this quilt in the back of my mind. But who wants to rip up and fix an old quilt? 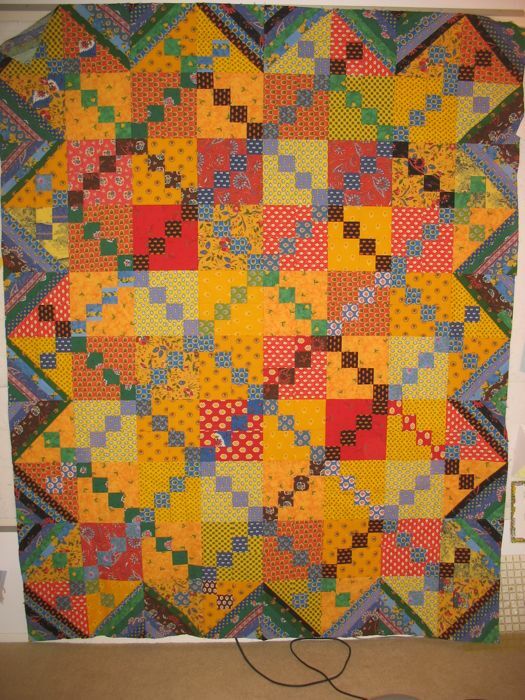 Maybe that’s how some of those quilt tops that are present in other booths at the quilt show came to be: lovely tops but just not quite right, as if the maker put it all together then decided to move on to something else, the top folded away to be taken up at another time. But now I have the fabrics, the time. 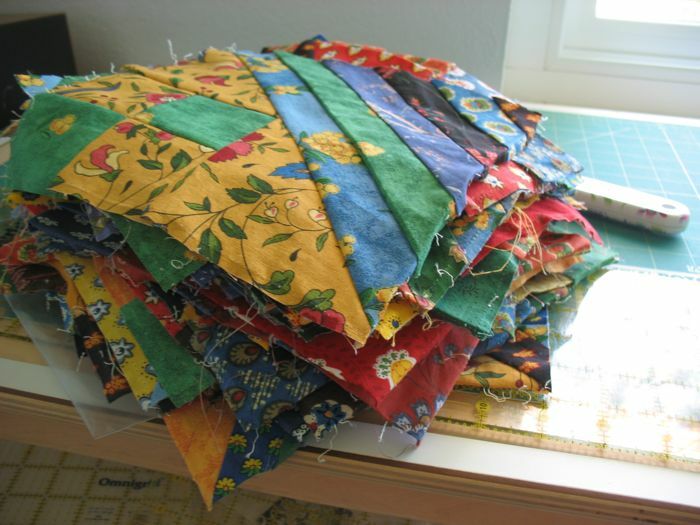 It’s a leap of faith, I think, to un-make a quilt. This stack could easily become a pile of blocks put back into a box to be sold some years hence at a quilt show. Or passed down to grandchildren who are learning to sew. Or given away to the thrift store. Or simply chucked in the trash. I took several deep breaths before giving a satisfying tug, pulling it apart at the seams. It took me the better part of an evening to do this. I listened to the radio show This American Life, streamed down on my computer, listened to sounds my husband was making as he worked and moved through the house, thought about someone I loved who had just announced he was divorcing. I’ve been in that situation–divorcing–and that too, is a leap of faith. Only instead of blocks, there are children, houses, cars and sofas. Instead of threads, there are memories. But sometimes a marriage is just not right, and like a quilt, the problems often don’t show up until the quilt is complete. I worked steadily, setting the separated blocks in a growing stack. When I finished that night, I had a soft pile of four-by-four squares, and a mess of thread on the carpet. I turned out the light, and went to bed, offering up extra prayers for those who are un-doing, ripping apart things to set lives finally right. Un-making, I think, is an act of courage. Beautiful, heart felt writing. I love your first quilt, but the second one will have more love in it. I like the first quilt, too, but I understand. We have been doing this to our garden. The evergreen shrubs were healthy and easy to maintain, but the yard was lacking something, and needed to be put right. So we have been cutting and digging out and planting anew. I hope things work out for the loved one. My heart breaks for people who go through that.